Slumping exports slowed factory activity in some of Asia’s biggest economies in August, although China managed modest improvement thanks to solid domestic demand, a series of surveys released on Thursday showed. Brazil shocked investors by slashing its key interest rate to 12pc from 12.5pc, citing concern over the mounting global slowdown as well as weaker growth in Latin America’s largest economy. But investors cautioned that gains would likely be limited ahead of key US manufacturing and jobs data due later this week. Signs of a weakening economy have led to speculation the Fed will step in with a new round of monetary expansion. 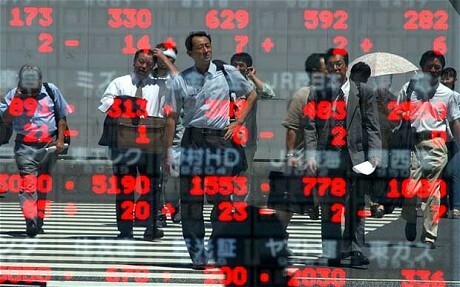 In Japan, the Nikkei gained 1.4pc to clear the key 9,000 level for the first time in two weeks, while the Hang Seng added 1.5pc and China’s Shanghai Composite fell 0.2pc. China’s official PMI offered some reassurance about the pace of growth, rising on Thursday to 50.9 in August from a 28-month low of 50.7 in July and signalling some stabilisation in the manufacturing sector on solid domestic demand. However, the result was just below expectations and the sub-index for new export orders dipped to 48.3 from 50.4, suggesting that exports may weaken in the future.